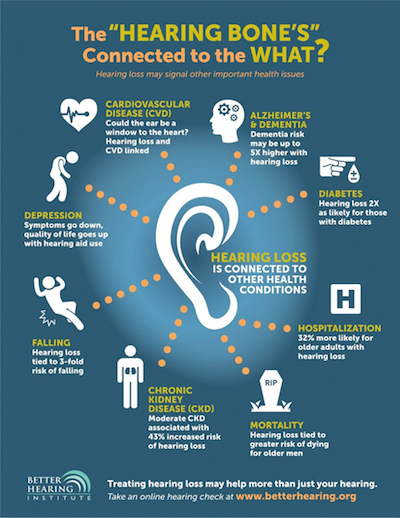 Hearing Loss affects all ages, and can be connected to other health conditions. Is characterized by damage to the organ of hearing the Cochlea or damage to the auditory nerve (together called the inner ear). Damage can occur due to: noise exposure, the natural aging process, disease or can it be hereditary. 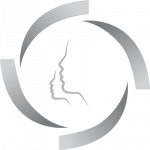 While there is no “cure” for this type of hearing loss, treatment options have improved significantly allowing us to better help those who suffer from sensorineural hearing loss. Is when sound cannot reach the inner ear (cochlea and auditory nerve). 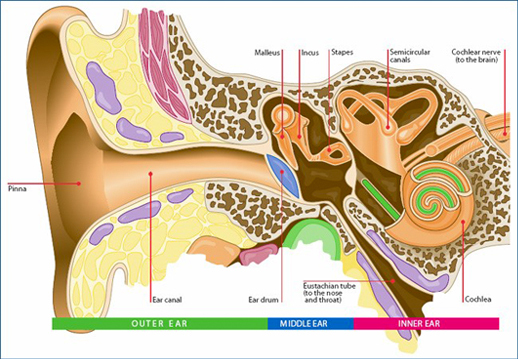 Conductive hearing loss involves the ear canal, ear drum, or middle ear and its tiny bones (the malleus, incus and stapes). It usually results from a wax blockage, punctured eardrum, birth defect or ear infection. Some people may also have a genetic predisposition to this condition. Conductive hearing loss generally can be corrected surgically. You will work closely with our Ear Nose and Throat (ENT) doctors to assess this type of hear-ing loss and decide on a treatment plan. Mixed hearing loss is when there is a combination of sensorineural and conductive hearing losses.